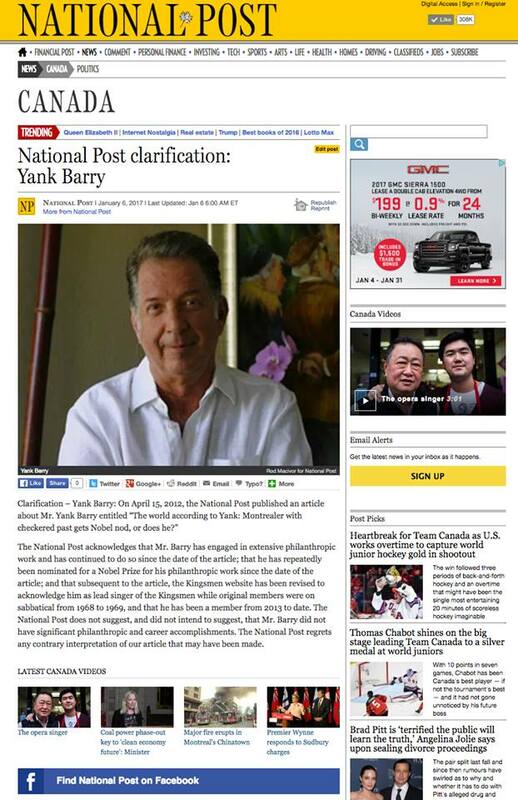 After over 3 years, the National Post apologizes to Mr. Barry. After over three years of battling against and withstanding the repercussions from a National Post article questioning Yank Barry’s character, career and philanthropic efforts, the Post has set the record straight following a lengthy dispute and tumultuous litigation. 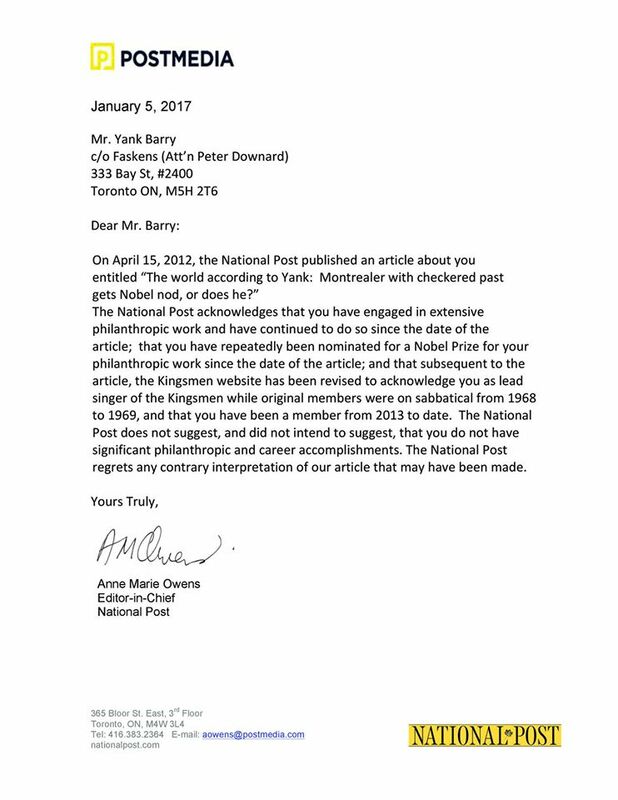 An April 12, 2012 National Post article suggested Mr. Barry’s global humanitarian works were embellished, in addition to questioning his music career which includes his time as the lead singer of The Kingsmen. Mr. Barry’s foundation and team have vigorously disputed these allegations. On January 6, 2017, in publications at its website home page and its print edition, the Post expressly acknowledged that Yank Barry has engaged in extensive philanthropic work, prior to and since the date of the 2012 Post article; that he has been repeatedly nominated for the Nobel Prize for his charitable work; and that he was a member of The Kingsmen from 1968 to 1969 and from 2013 to date. The Post stated that it regretted any contrary interpretations of the 2012 article. “I am pleased that the National Post has set the record straight,” Mr. Barry said. 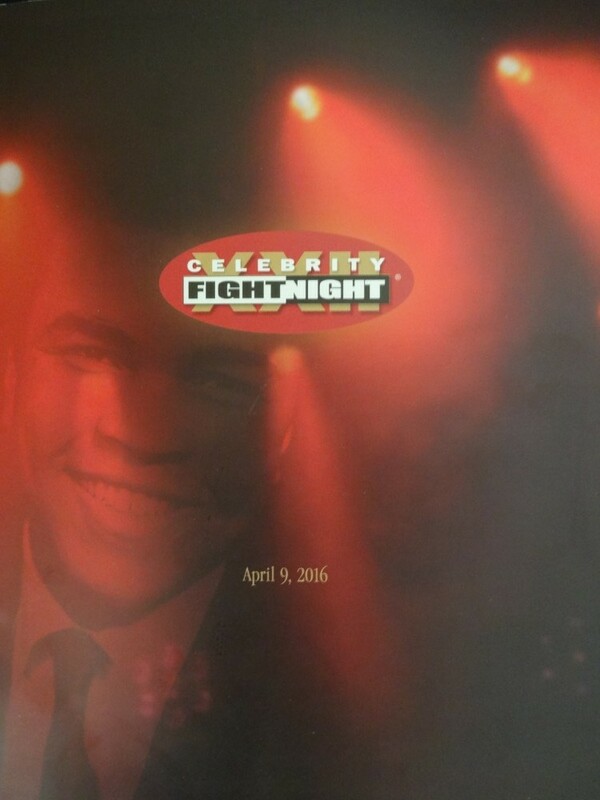 Mr. Barry said he will continue to use his time and talent investing in causes that benefit those in need. About Global Village Champions Foundation: Started in 1995 by Yank Barry and co-founder Muhammad Ali, Global Village Champions Foundation strives to become the undisputed world leader in private, humanitarian delivery of nutrition to needy persons across the globe, while sustaining human life and helping to eradicate hunger from the face of the Earth. With the help of donors and notable figures such as Gary US Bonds, and Evander Holyfield, the nonprofit has provided more than 1 billion meals to the hungry around the world. The charity’s mission also includes rescuing refugees who fled to Bulgaria. Mr. Barry’s philanthropic work has been recognized my many well-known foundations as well as major media outlets worldwide, including being a three-time Nobel Peace Prize nominee.